For Valentine’s Day, a group of employees of the Chicago Riviera Finance office participated in the “Cookies from the Heart” program at a local Ronald McDonald House. 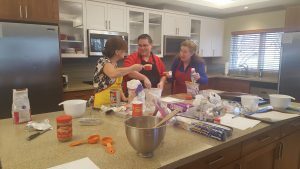 Kim, Helen, Greg and Michelle coordinated the visit and baked Peanut Butter Blossom Cookies for the families staying at the House. They purchased the ingredients and baked in the full-service kitchen on site. The team visited the Ronald McDonald House located near the Loyola University Medical Center in Chicago, Illinois. There are 5 Ronald McDonald Houses in the area that provide a supportive ‘home away from home’ for families while their child is being treated at a nearby hospital. The House has 18 bedrooms and is decorated based on the children’s book, The Secret Garden, with several secret places to be enjoyed by all. 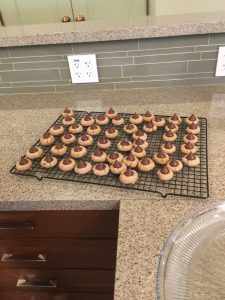 “Our employees volunteered our time to bake cookies, so when the families came home after a long day at the hospital they were cared for with treats,” said Kim. The House offers comfortable, private rooms where families can get a good night’s rest knowing their child is close by and gives families the opportunity to connect with others going through similar experiences. During their stay, parents can exchange stories over a cup of coffee in the kitchen, while siblings bond with new friends in the play room. Every night, 153 families are able to heal together because of the comfort, compassion and community found at each of the Ronald McDonald Houses. Volunteers arrive daily, offering their welcoming smiles and helpful hands where they’ll tidy things up and provide home-cooked meals. Laundry and computer facilities provide accessibility and convenience. The folks who work at the House are always there, providing care and comfort to families during their greatest time of need. 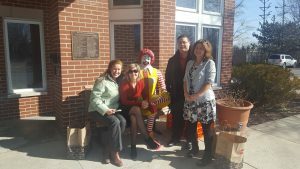 Visit www.rmhc.org for more information about the Ronald McDonald House and how you can volunteer your time. Our Chicago team plans to volunteer their time again next quarter. Riviera Finance is a leader in business financing. Get more information about our invoice factoring services and how we can help your business.